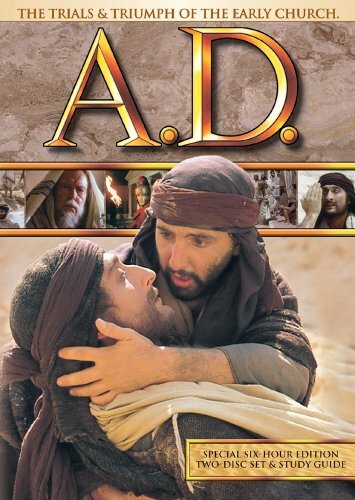 The Book of Acts comes alive in this epic covering the years 30-69 A.D. Filmed on location in the Middle East and Europe, A.D. vividly depicts the rising confrontation between the mighty Roman Empire, Jewish zealots, and early Christians. Painstakingly researched by award-winning producer Vincenzo Labella, this compelling mini-series blends Biblical narrative with historic incidents and engaging fictional characters. Rejoice with Christ's disciples at Pentecost, and cry with them at the stoning of Stephen. Watch the Church grow -- Saul is dramatically converted, Peter performs wonders, and Philip baptizes the Ethiopian. Witness the barbarous treatment of Christians at the hands of Roman leaders, and finally, marvel at the great triumph of the Church, despite persecution and the martyrdom of Peter and Paul. A.D. is the perfect resource for any church or home study group wishing to explore the New Testament period, the Early Church, or the Book of Acts. Please note- This is a six hour edited version not the nine hour full length television version. If you have any questions about this product by Vision VideoGateway Films, contact us by completing and submitting the form below. If you are looking for a specif part number, please include it with your message.